Darn Good Yarn is an online store that is dedicated to supporting women’s economic empowerment, fair trade practices, and principles of environmental sustainability. The company offers dozens of reclaimed and sustainable fibers, cloths and yarn, as well as, clothing, patterns, notions and home decor. In doing so, they hope to encourage the joy of crocheting, knitting, beautiful garments, and ethical consumerism. If yarn is your thing, you might be interested in Darn Good Yarn of the Month. 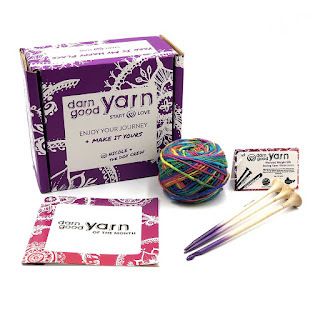 Each month you will get a skein of Darn Good Yarn or another brand of artisan quality yarn. Sometimes you receive a mix of other small businesses as well. You can skip a month at any time. Your yarn club subscription supports a small US-based business fueled by the passion to help others and keep you crafting with fun items. *This post contains affiliate links. Please do your own research before purchasing products or using services. Your opinions and results may differ. I can see my MIL loving this - she's an avid knitter! I haven't done too much knitting, but this looks like a very fun subscription box for knitters in the family!